My sister, brother in-law and I were sitting in the dining room of their apartment while my sister was checking out her new camera. She took pic #1 (nothing on first pic), and then just about 30 seconds later she took the second pic. I have no idea what I'm looking at, but my brother in-law says it's just shadows. I say no way it's just shadows. There has been no paranormal activity in their apartment before or after the pic was taken. This is the first place I've posted the pics. They were taken about a year and a half ago in Trenton, Ohio. If you have any idea what it might be, I would love to hear about it. Thanks for taking the time to look and for your consideration on what it may be. Notice how much darker the pic is as well. I'm not sure of the meaning behind it, but it does stand out. This was the first pic taken (seconds before pic #2). We took more, but nothing was there. We no longer have those pics. Read about shadow beings from the dark side. Double exposure. You can see where the person's legs are moving as they are walking by. Wow that's really scary! That's definitely a ghost. I would bless the house if I were you! Looks like from pic one. There is a blue object at bottom left. Looks to me to be a blue jean skirt. 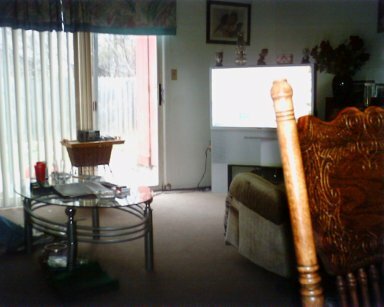 I think that person got up and walked across living room and since the camera was new. Maybe pushed a button to slow down the shutter speed and finger blocked flash. Notice in "GHOST" pic, object is not in left bottom corner anymore and images looks firmly to be a girl with skirt on walking through living room briskly. Not a skeptic, but a believer. This is just too easy to figure out with logic. -Legs of your "ghost" are at an angle, just like when someone runs by. That, and the figure is at sideways profile. -The television's colored gradient is produced when a blank screen is filmed at extended exposure. Try it yourself if you don't believe me, but do it in a well-lit room like the picture. -An explanation for why the room is darker would be because YOUR EXPOSURE TIME IS EXTENDED. The camera is auto-compensating for the extra light that it's absorbing. -Though it's slight, there is more blur in the second picture than in the first. Not sure if it matters, but the blue piece of cloth (blanket? shirt?) at the bottom left of the first image is gone from the second image. This is all based off of rudimentary common sense and basic knowledge of how a camera works. Come on, people. An angel of death? More like an angel of hoaxes. Taken "30 seconds apart". From comparison the photographer and camera were in the EXACT same spot in each photo (without a tripod, near impossible). However, in that time, the chair on the right of the photo was moved significantly - looks like at least a foot or more. In addition, what appears to be a person's leg and foot near the left lower part of the photo (near the table) is no longer in the frame. I call shenanigans on this one. No flash, fast exposure due to the back-light from the windows... probably what we're seeing is the person who was sitting on the left (at best), a "fake" at worst. It's an angel. You can clearly see one of its wings. I agree with everyone else. The shadows that are on the blinds. Look completely like the shadow of wings. Since no activity is present, I think an Angel just came to say hi to you guys. Enjoy have a good day. The first picture is noticeably darker than the first, and, not trying to be a downer or anything, but it looks sort of like the flash on the camera was off and someone was spinning with long hair in the picture. I do agree, it sort of looks like wings, but I think it's all in a matter of opinion also. If there isn't any paranormal activity happening after the photo was taken, good!.. That was an angel.. Yes maybe an angel of death but it does not mean bad.. It's nothing to be scared of because angel of death is a good angel !!!! If this is in fact 2 separate pictures like you claim say it is, how come both pics are of the exact same spot in the room? Not unless the camera was on a sturdy tripod. But you never said it was.. There's plenty of possibilities. Notice in the first picture that she uses the flash, in the second picture it's a shadow. Well there's numerous and endless possibilities. And I highly doubt that it is an "angel of death" for if it was, you or a family member would have been haunted or most likely injured or hurt severely in the process of moving in and or living there. And a djinn? Really? Highly impossible. It could have been a passing by spirit, but then again I am highly skeptical of this picture since it was taken during the day. But then again, anything is possible. But for my eyes and my mind. It is just a friendly spirit passing by to say hello. Or just a casted shadow from outside from the panel curtain. That was the angel of death. Notice the wings. And he appears as a black shadow figure. I think it's a djinn, well a djinn is like a ghost from another dimension of life, but it looks like it's walking very fast and still looking into the camera. It looks like someone is walking by very quickly in shorts. Notice the shapes of wings anyone??? Not all spirits are dark and if there is nothing negative going on I say angel!! Hi every one, well the photo I have seen for me isn't a good evidance, but I want to say that those creators (Ghosts) existe as we existe some of them are good and some are bad can harm badly the human. I have seen many times ghosts when I was young and at 20 years and 35 years I already tell stories about the ghost farm and when I worked in desert. one thing I want to say avoid places that ghost live in don't try to disturb because they deffend them selves as we deffend our selves, if some one touched by he will be serious sik, I mean montal ill.
"In fact nothing I have seen on this site looks at all real to me." I don't know why he didn't follow up with, "In fact, I've never seen a ghost photo that was real. There are no such things ghosts." Besides being arrogant and pompous, he's just a troll who hides behind the anonymity of his keyboard. He'd never have the "huevos" to act that way face to face with someone! Unfortunately, web is just crawling w/ his ilk! Peace and Blessings from Seattle!! If this photo was taken just seconds later then why isn't there a blue triangular shape next to the table on the far left hand side and also the chair isn't in the same place. Which means whoever took this photo did a normal photo then made made some changes, made the room darker put a transparent-ish ripped cloth in front of the lens. This could easily be made just to joke people. 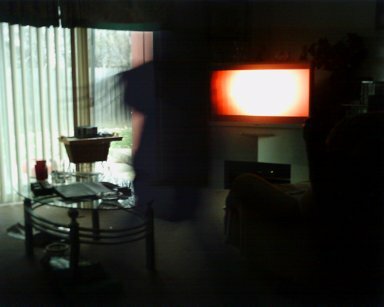 I am a huge believer in ghosts and the paranormal, but I was just curious on what type of camera was used to take these photos. If it was a film camera, it could've just been the film itself. A few years ago, before digital cameras were all you could buy, I got a film camera as a birthday present. [Not sure what kind because it is loong gone now.] When I was taking photos with the camera a few came out weird, like yours, only because it was the film I was using. Usually it was the first and second photos taken, and the last two photos that were funny. Always like that. So, it could've just been the film. Other than that, it's a pretty convincing photo if it wasn't a film camera! What if one of you have a demon. You know one that follows you where ever you go, hunts you? But it could be a angel looking after you if you never been hunted before. Well even if there is no paranormal activity before or after the pick does not mean there isnt a ghost in the place the ghost just may not want its self to be know. I don't believe this is photo shopped, then again I'm not the expert, but why would someone go to so much effort and time to photoshop this and put it on here? It looks like something is... kind of sapping the energy from the camera and making the flash weaker. I think it looks like it could be an angel. This is purely my thoughts, and believe me, I am no skeptic. I have been seeing and talking to spirits since I was a kid. This seems a bit authentic, and I have my own photos that I have not decided to share with the world. Like when I went to prom a few years back and caught the face and body of a boy standing next to me in my photo, but there were no people standing next to me. And upon closer inspection I realized it was a ghost that frequently follows me, a 19 year old boy with shaggy blonde hair and green eyes who hung himself after being one of the first French immigrant to travel to America. He told me that I would love him one day, and idk if he meant him as in a reincarnation, or as in another French man. Personally I think this could be a dark spirit trying to catch your attention. Has any member of your family died recently who would have any reason to want to contact you. I would recommend trying a seance. You could try lighting some candles and if they flicker try talking to your spirit. It's possible that there was a flying insect in front of the camera. I've seen many shadow spirits - not on camera, but in front of me - so I know they are around, I don't know if this is proof of one, but it's interesting. If in fact this was photo shopped then this person has some major skills. Notice how the faethered edges of the apparition goes over yet you can still see the glass table through it? Photo shopping would of greyed out the table not allowing you to see it through the dark trailing ghostly form! Come on folks let's not be so hard on your brothers and sisters. If you are seriously trying to discover the truth then I suggest you look elsewhere, the internet is mostly full of people just wanting to have fun and get alittle spooked...like me! It is actually you or one of your friends, edited in photoshop! If you try to make a fool out of people, then at least hide the arm!! It looks like a human arm!! Wow a lot of people are very judemental, I don't know much about photoshop, but I do know that demons, ghost and spirits walk the earth everyday in search of something. These photos are not the same! 'Anonymous' said: "It's the same photograph in both shots, you can overlay them in an editor and they are identical." I did. They are not (read my comments here of July 25 and Jan 11 2009, and Dec 13 2008). I've examined a great many such photos using Photoshop from various websites as well as Brenda's. Ed's photo is one of the few that has convinced me that some kind of anomaly has been captured, for all the reasons which I have previously given on this thread. I for one am not questioning Ed's integrity. It's the same photograph in both shots, you can overlay them in an editor and they are identical. The second/ghostly pic has been blurred, and upon sharpening, lightening, and "fixing" the contrast, you can see that the "ghost" has been drawn with an Airbrush or something, and the "wing" has been created with the smear tool. Come on... Had to go the extra mile with the wing tips huh? Lol... Silly people.. I agree with katie i think it is a woman with long flowig hair & a man in front of her.most definatly lovers.! Trust me this is paranormal activity! Whatever this is, it is a woman with flowing hair! If you look to the right of it you'll notice another figure. It's a man! They were most definitely lovers! This apartment has a story to it, a couple dies at those apartments. I'm not sure it was in that specific apartment but the ghost might be going from 1 room to another. Looking for something. They didn't want to disturb you that's why you had no activity. They are very calm! Trust me I know a lot about this. You may not believe me. But I can't see ghost. I read spirit orbs and everything. If your sister and in-law feel scared, they shouldn't. These are very friendly ghost. I could be "off" a little but I'm fairly sure I can't understand this photo. Thank you for your time! If you look at the pic with the shadow, look in towards the floor by the couch and the small table it looks like it has legs, then if you look at the glass door you can't see that it has wings.. While I do not have any idea what would have caused the shadow on the picture I seem a bit skeptic that it is anything paranormal. If you look at the bottom of the shadow figure you can two shadow lines clearly leading back in the direction of the camera. This kind of makes me think that the shadow is coming from behind the camera. Secondly the angle of the camera has changed so even though it is a before and after shot being the angle changes it is hard to say that the shadow position hadn't changed. You can call the angle is different because of the wooden chair. While it is both photos and merely hidden in the blur of shadow in the second. In the second photo the TV is clearly being obscured by the top of the chair. This is not the case in the shadow figure photo. So we know the angle clearly must have been moved slighty and it appears from the shadow lines that the light shadow seems to come from the direction of the camera. If it was a film camera I would be curious to see the negatives of it. See if these pictures were actually sequential in the roll and not just an after image from a photo that did not get exposed correctly. If the angle stayed the same and the shadow lines at the bottom were not present I would be more convinced but those 2 things make it hard to see as anything paranormal. Just my 2 cents though. Having previously commented on these two photos myself, the analytical and thoughtful comment by Anonymous is indeed just the sort of thinking that is so helpful with such material. Ed Brown's own reaction to that comment adds still more useful information about the circumstances in which the photos were taken. What makes this pair of photos so intriguing is exactly that: they are a 'pair'. Apparently purely fortuitously, they show a 'during' and an 'after' shot, which in my experience of looking at such material is incredibly rare. In fact, I've only come across it once before, and that as well was fortuitous. And, as here, the 'during' shot which showed the shadow 'event' (for want of a better word!) was never satisfactorally explained. Personally, I still find Ed's first photo one of the most intriguing on Brenda's whole site, and unless a really convincing explanation can be supplied by someone, I still consider it to be one of the best 'captures' of such an event that I have come across anywhere. That's a great review!! Let me first rebuttal a couple of things. The pics were, without question, not taken while the camera rested on the table. My sister was sitting at the table and in both photos, she simply raised the camera to her eye and took the shot. She wasn't taking a picture of anything in particular. My brother in-law and I were in the dining room the whole time... We didn't wonder over from the sofa. The legs you see in the bottom left hand corner are from my nephew, He was sitting there while both pics were taken (he was the only one in the living room watching t.v.). He simply readjusted his legs and they couldn't be seen in the second pic. I'm glad to see a "skeptic" (for lack of a better word) who at least puts some thought into an analysis. Thanks for your comment. I also noticed that someone's legs/feet are covered with a blanket on the far left by the coffee table in the first pic, but missing in the second. If the shutter/aperture speeds automatically adjust in this camera, (as in many new and digital cameras) it would have been reset to very small aperture (and therefore slow shutter speed of up to several seconds)to compensate for the brightness of the daylight coming into the lens. She may not have realized that the picture had not finished being taken before this person (you or your brother in law) got up off the couch and walked in front of the camera, adjusting the blanket/robe as they walked and paused just to the right of the frame. This could have left an underexposed (dark) picture with blurry (moving) and figure images, and explain the missing person from the previous pic moments before. With an accidental long exposure like this, its difficult to get clear images without a tripod or steady base, but a table works fine, especially if the camera stays on the table. Your sister moved the camera slightly between pics, but the proximity of the chair back makes it clear that it was resting on the table both times. Brenda I do not mean to step on your toes but why try to have an explanation for everything. Some things are just paranormally explained and sometimes it's best to just say, "look this may be a ghost but don't worry it doesn't mean harm to you or anybody else." I really am not trying to be mean I just want everyone to know the truth. And the truth is not always explainable. I simply think mac should stop spazzing. this is an interesting photo. thing about the paranormal is sometimes, alot of it can't be proven, or disproven. some of us have had experiences, we don't need scientific perfect concrete proof. The science is just emerging into the mainstream. soon we will have our undeniable proof, but even if a non vaporous full bodied apparition stood and stared into the eyes of a skeptic, they would dismiss it as light play, or something else. everything can be debunked if you go far enough into skeptic territory. i believe that its the same pic, the second photo looks identical to the first just darkened. however in the 1st pic you can notice a very faint silouette, possibly light??? Well it looks some demon i saw in a movie and then i seances things and i see it looks like a demon in the pic. If u watch the movie the village then it looks like the monster demon from that movie and it looks scary. The picture looks like a double from another shot. Not sure exactly how to say it. But another photo on the camera was that of a woman whose hair was flailed out, perhaps a shot of her dancing and it impossed onto this shot. It looks to me like the black "wings" is that of someone's hair while swaying her head swinging her hair out. I'm getting caught up after being backlogged for a couple of weeks. I haven't caught up with all of Mac's comments, so don't know the extent of his contributions yet. However, all rudeness will be edited or deleted. I am telling you all this because, while everyone has the right to their own opinion here, this is a place for respect. I don't tolerate flames and idiocy found on other sites. Sorry, but I personally despise that stuff. I hope this messages helps to restore some tranquility to this page. By the way, I own this site and don't believe all the submissions are true. I always offer my own debunking advice - there have only been a couple I couldn't figure out. There are many other submissions that don't even get accepted. So it's okay to be critical. I just ask everyone to do it with respect. This is what i'll try to do. First, I would like to thank Amberjack for his/her comments and support. I truly have no idea what this is... but, I know it was there. Second, I really should apologize to Mac! I guess the good thing about this web site is that we have a place to express our opinion, good or bad! Actually, Thanks Mac for your opinion. I just felt that my he was questioning my honesty and morals. But, lets be honest... I dont think everything i see on here is real either. So, thanks to everyone who comments on this site. Third, and the reason I'm making this post. I'm going to research and try to find a third party to look my photo over and give their opionion of what it is. I promise to post whatever they say... good or bad!! I really love listening to everyones comments, and i probably shouldnt get upset when someone thinks its fake... But, i cant help it. I was in the room and I saw nothing at all!! I was one of the first people to see the picture on the camera... It has not been altered in any way (i feel like a broken record)!!! The comments of 'Mac' on this thread and elsewhere on this site are so pompously dismissive that I suspect that, either he is a stitch-up troll, or that he is so desperately afraid of the unknown that the only way that he can cope with his fear is by dishing out an overdose of negative scepticism. I wonder how long his "short time in the photo industry" actually was? About twenty minutes? My own professional experience is considerably longer by a few decades, and my two previous comments (Jan 11 and Dec 29) endorse both the authenticity of the photo here and Ed's sincerity. My opinion is unchanged. You must not have been very good at your old job!!! I dont know you or what you USED to do! But, i can say you probably were not very good at it. This photo has NOT been altered in any way!!! Thanks to everyone else for their opinion. Take a very close look at these photos and compare them. Look at the wing apendage and you will really notice that this is a doctored photo. Look at the shape lines of the object in relation to its background. This photo appears to obviously set up in relation to the backgound. The wing and body are positioned just right to give it the perfect contrast for the perfect kind of ghost shot for maximum effect. Notice how the wing area appears to have been given extra exposure for more effect with the blinds. Nice PhotoShop technique **removed**. Also notice the amount of daylight in each of the photos and ambient room lighting. This was a staged photo. I worked for a very short time in the photo industry **edited**. I worked much longer in the intelligence community **edited**. In fact nothing I have seen on this site looks at all real to me. i think it looks like Cody Maverick from the peguin movie surfs up. An angel, but whatever it is appears to be floating in mid-air and the thing sticking out appears to be a sleeve of some sort with tendrals or wispy somethings or other. Would make me think twice. I'd like to respond to Garden's comment. I tend to think that we are inclined to interpret these things through our personally-held beliefs. So we call them djinns, or demons, or fallen angels. But these things belong to an order of reality that we are not even close to understanding. I kind of think that even to have a hope of reaching that understanding we need to let go of such preconceptions and try to see them as they simply are (which is difficult enough! ), and give them terms which are straight paranormal in context. Not to say that I don't find Garden's comments fascinating, because they offer some interesting details. And as in my first comment on this photo at the end of last year, I still think that this shot of Ed's is one of the best of its kind that I've seen anywhere, and I am convinced of Ed's sincerity. This looks like a jinn or djinn. Its a being made of a smokeless fire. You hear about them in the Koran (the Muslim bible if you will). Its where the genie comes from. They can't shape shift and people that i know who see them describe them as a dark shadow with a human form however their actual form is leathery spindly looking (if this makes sense). It is said the djinns refused to bow down to man kind and that a very powerful jinn is actually what Christians call the devil. They seem to be prevalent, some djinns can't be very powerful, old and evil. Think what we call "demonic". But they can't also be kind and harmless toward humans. Interestingly enough jinns that hang out at and or by cemeteries are called "ghouls". They (djinns) live long but do eventually die. I've been looking at these two pictues for about half an hour, I even put the one with the shadow into a photo editing program (PhotoImpression 4)to lighten it up. Some people have commented that the chair on the right hand side isn't in the darker picture, but it is, it's just in too much shadow to be able to be seen. When I made the picture lighter, it showed up. This truly baffles me! For a lot of pictures, it's easy to say that it could be this or that (and I'm a bit of a sceptic, I always second guess), but this picture is truly different. I don't know much about faking photos (I don't even own Photoshop) but I'm guessing it would take a lot of effort to pull this off. When I brightened up the image, I could actually see the edge of the window as well as the wall through the figure! What had me really interested was the wing, or what looks like a wing. A previous comment mentioned angels, and I would like to think this would be something like that, instead of something demonic. At any rate, sorry for the super long comment, but this really facinated me! It looks like something with a wing I don't know. A demon maybe?